A new venture, kinda like roll your own . . .only different. I know I said that the next time I blogged I would say something about my riff on the Dominy clock, as seen and done by the big man in plaid, It was very enjoyable to do the basic construction but the move and lack of heated shop will hold off the finishing process for a while, not to mention a lack of funds to purchase a quartz movement... sigh... oh well, we move forward, and the clock shall sit in the corner of the living room, built but unfinished, at least until summer. All that to the side, I will explain my new mission! If you don't know, I don't think I have advertised this too much on this blog, other than my family there are 2 passions in my life. One of course is making sawdust. The other is viking age and medieval reenactment. For those of you possibly unfamiliar with the concept. Reenactment has to do with studying history and attempting to recreate an experience similar to that time in history, hopefully for yourself to experience, but usually, and probably more importantly, to help share that knowledge and experience you've gathered reliving and studying the lifestyle to those in the general public. I could talk forever about viking age history, as much or more than woodworking, but I will just stop here with most of it and say if you want to learn more about that side of my life you can go to the web page for the group I co-founded in 1996 by clicking on our name "Tribe Woden Thor"
Our group does several school, library, and festival events each year. Where we set up different aspects of what life was like, from the knight to the lord to the common man, then we interact with those who come visit us to teach them what we can. For a long time I have wanted to set my sword and spear to the side and set up a display that demonstrates a combination of both my woodworking and historical lives. 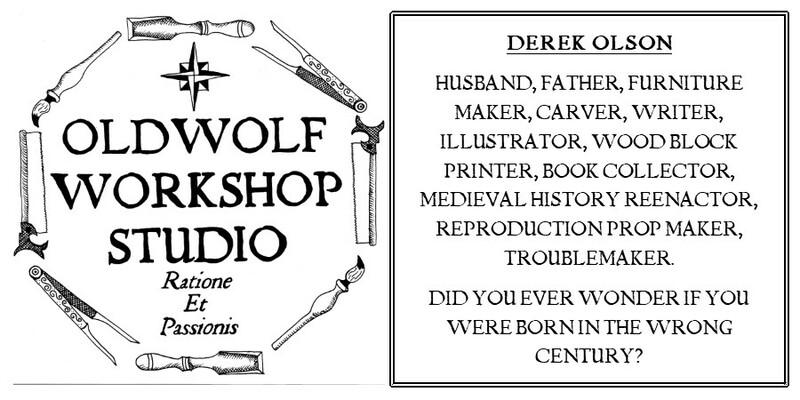 My vision is to set up a small workbench with a tool station behind, and spend the weekend of the festival, woodworking, with as close to period tools as I can get. 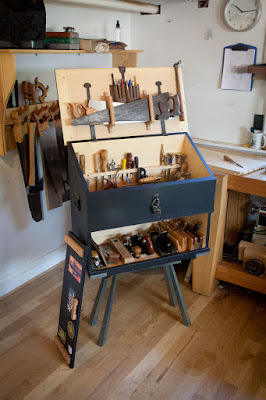 (there is evidence of viking age woodworking tools... Google "mastermyr chest") Realistically my tool set up will be closer to 16th to 18th century, with the exception that I hope to procure and use spoon augers instead of twist augers. Again, the usual hurdle will be finances... The hand tools that I have been able to collect to this point are pretty modern looking, plastic handles being the most obvious anachronism. I have tried to make several bargain purchases via eBay, but things always get bid up higher that I want to go. Saws will be the biggest thing for me to tackle. chisels and planes I have, or can work on. The saws I use in my handwork all look like crap. Then, this morning whilst lazing around in bed and listening the magical sounds of my children diplomatically discussing the programming outline of their Saturday morning, I had a small epiphany of sorts. Why not modify my current tools to look and work with wooden handles. Certainly I can build versions of these tools more economically than searching for and buying them online, antique store, or otherwise. So the next few steps of this web experiment...blog of my work and methods, will indeed follow me as I embark on the attempt to create, some from existing tools, some from scratch. 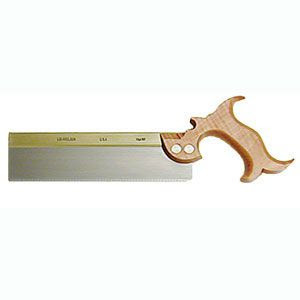 I believe I am going to start with saws, as I believe that to be my most immediate and needed area of improvement, First I want to modify my Vaughan Bear back saw into a wooden handle beast of burden. 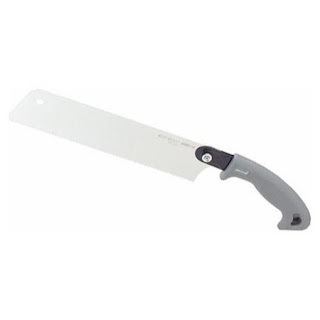 I will permanently remove the plastic removable handle forever and place a handle similar to this Lie Nielsen Dovetail Saw. I will also modify my flexible flush cut saw (my favorite saw!!) to have a wooden handle , change the handle on mt least favorite saw, a jack brothers dovetail saw that currently switches from a left hand to a right hand grip (This is the first saw I bought and it has never cut well, but then again I didn't know anything at the time) and I am going to attempt to build both a bow saw and a tenon saw from scratch. This project will also include teaching myself to sharpen and possibly modify the teeth of these saws and to sharpen the teeth of my full size crosscut and rip hand saws inherited from my wife's grandfather. I'm sure there will be other projects to follow, A wooden brace, making my own wood planes, those things come to mind immediately, there will be more. So this all being explained, there will be more to write when there is something done... Hoping maybe Tuesday I'll have a chance to start!! As usual I will take a ton of pics and try to update this regularly, I know I know, best laid plans of somebody and that other guy... but I will try. Until then, happy sawdust everyone!